His exceptional mastery of the viola, fluidity, and dazzling sound projection made a convincing case for the importance of this piece [Schnittke Viola Concerto]. ...The eerie cold of the high, opening harmonics gave way quickly to a persistent soulfulness. Penderecki covers a lot of emotional ground, and the closing sequence flowed with a lovely inevitability: a pensive timpani-double bass pulsing that builds, settles, and sends violin and viola ascending to a poignant resolution. ...the depth of expression and large, vibrant resonance of Diaz’s playing swept through the sanctuary of Coral Gables Congregational Church. Roberto Diaz’s impressively sonorous viola solo launched the finale, exuding brightness and verve. As the theme was alternatively tossed between the instruments, the musicians took full advantage of their solo opportunities but never at the expense of the ensemble effort. From the outset, Díaz produced a warm and luxuriant tone. ...the Diaz Trio, with guest pianist Santiago Rodriguez, provided some outstanding musicianship...It was a stunning performance, and one that deserved the enthusiastic ovations. It was a beautiful debut performance of a modern composer that emphasized the awesome, powerful sound of the viola. All three Brahms sonatas lean toward introspection, which gave Diaz numerous opportunities to send phrases singing poetically into the air. At the start of the opening work, Op. 120, No. 2, his playing was so personal that you almost had to sit forward to take in the nuances. Diaz’s flawless intonation, impeccable high notes, and emotional range gave the impression that this was exactly the way Brahms intended this music to be played. I was unprepared, though, for how beautifully and musically he plays. He has superb control of his soft playing, and his sound is simply gorgeous. He also has a talented accompanist in Jeremy Denk, who brings out some details of Brahms’s writing that had escaped me in the past...A fabulous recording, even if you already have a favorite. Violist Roberto Diaz (former principal violist of the National Symphony) was especially impressive, since he now has a full-time job running the Curtis Institute. There was no rust whatever on his administrator fingers; the sound poured out with confidence and élan. As the audience at Gusman Concert Hall listened to a performance of Mozart’s Piano Quartet No. 1 in G Minor on Monday evening, there was little hint of the mighty struggle it took over the past few days to bring that work and this concert to the stage. Guest artist in Schnittke’s tenebrous Monologue was violist Roberto Diaz. Former principal violist of the Philadelphia Orchestra, now president of Philadelphia’s Curtis Institute of Music, Diaz met the challenge of both extremes handily. Not incidentally, he also demonstrated what the viola can do. Violinist Charles Wetherbee (symphony concertmaster) and guest violist Roberto Diaz then joined the orchestra for Jonathan Leshnoff's Double Concerto for Violin, Viola and Orchestra. This performance marked the Ohio premiere of Leshnoff's 2007 work. 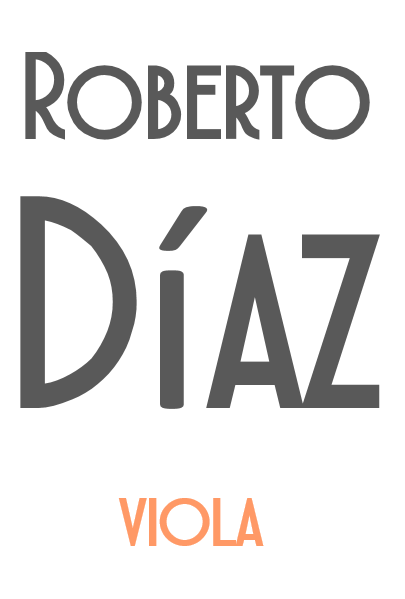 Become a fan of Roberto Díaz to hear about new music, videos, event info & special offers.